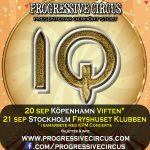 Since IQ performed their first full length concerts ever in Sweden at Progressive Circus 2016 in Malmö, and in October 2017 in Stockholm, there has been plenty of requests for a return. In september it’s time for both a Copenhagen visit for the first full lenght Danish show ever, and then a return to Stockholm, with a brand new album released! ”The Road of Bones” from 2014 has been hailed as a dark masterpiece, a new peak in IQ’s long history and appears on many best-of-lists in progressive rock. In it’s live format, the material has taken on further dimensions, not least thanks to Peter Nicholls’ theatrical stage persona and charismatic singing. On stage you will also see Mike Holmes on guitar, Paul Cook on drums, Tim Esau on bass and Neil Durant on keyboards. All of them have been around since the debut ”Tales from the lush attic” (1983), except the ”newbie” Neil who joined in 2011.